More so than perhaps any other course in Oregon, there’s a mystery around the Fazio Course at Pronghorn. Oregon has gained a reputation over the last decade of being a world class golf destination, and I know quite a few people here who have played the best of the best. People have played Bandon. Many of the people I grew up with have played the Eugene Country Club. Crosswater and Pumpkin Ridge are reasonably accessible, as is the Nicklaus Course at Pronghorn. As I was gearing up to make a trip out there no one I talked to had ever played it – and everyone was jealous. Why so jealous? Who wouldn’t want to play what many consider one of the most well maintained courses in the world, in what is my favorite area of the country – Bend, Oregon. The very first review I ever did on this site was of the Nicklaus Course at Pronghorn. At the time it was one of the most enjoyable, and spectacular rounds of golf I’ve ever played (still is) – and this was in the middle of March, so you can imagine how the courses would be different in August. Driving down the deserted 4 mile road up to the gates of Pronghorn is a true reminder of just how remote this place is. Pronghorn is situated on 600 acres right smack in the middle of 20,000 acres of BLM land, easily making it one of the most secluded golf courses around. Just like last time I was greeted at my car by a friendly attendant who genuinely seemed interested in talking to me. The team at the pro-shop was just as accommodating and eager to help however they could. I headed out to the driving range to hit some balls, and meet with my host Collin Fowler, who is the Membership Manager out at Pronghorn. Within a minute of our conversation, I knew I was going to be in for a fun round. That being said, I already had very high hopes coming in. I shot my first ever 85 the weekend before, and am easily playing the best golf of my life. Anytime you’re playing a course that you’re this excited about, it definitely helps to be playing well. I had some confidence, but had no clue what I was actually going to be in for. The practice area for the Nicklaus Course is small, but one of the most beautiful I’d ever seen. The Fazio side takes this to a whole new level. Easily twice as big as the Nicklaus course, there’s room to practice chip shots from nearly 100 yards, and the separate putting green is massive. I rolled a few putts and was amazed at how fast and true they rolled. I’d heard stories about the quality and conditioning of the Fazio course, but it wasn’t until I actually stepped onto the greens that I realized just how true those stories were. The greens on the Fazio at Pronghorn were hands down the nicest I’ve ever played on – by a long shot. Eager to get started we headed over to the first tee and I was completely taken aback.While the Nicklaus is one of the most beautiful courses in the state, it doesn’t really ramp up the scenery til the back nine. Walking onto the first tee of the Fazio I experienced one of the most beautiful golf holes of my life. The lake to the left and sand bunkers that seemed to weave naturally into the high desert landscape let me know I was in for something special. To make things even better there was no one one the course. I was told the private side only received about 10-12 rounds a day – no wonder it’s in such impeccable shape. After a little debate we opted to play the rust tees (white tees). Both of the courses at Pronghorn are long. And while the Fazio is generally regarded as the easier of the two, the next tees back still measured a stout 6,934. If you went back to the tips you’re at a whopping 7,456! So while I felt like a bit of a wuss playing from the rust, which were a mere 6,431 in comparison, I knew it would make for a more enjoyable day – and I couldn’t have been more right. Whenever I’m playing somewhere private, with a pro, or with someone new I’m always nervous on the first tee. It can set the tone for the entire round, and the last thing you want to do is embarrass yourself at a high class establishment. Luckily on 1 I stepped up and knocked it right down the center of the fairway. I had an easy approach in and just missed the green. Settling for a 2 putt and bogey – which in my mind, is a total win at this point. Doesn’t get much better than this folks. Stepping up to the par 5 second I was feeling pretty good. Hadn’t made a complete fool of myself, but was still in awe as to the condition of the course. Every blade of grass perfectly manicured, and the greens running about as fast as any I’ve ever seen. From a course conditions perspective it felt like I was playing Augusta National in the high desert. This par 5 had a beautiful view of the hills of Central Oregon and it was becoming clear that bunkering was used in a much more visual way than on the Nicklaus course. I pounded my drive before flubbing a 6 iron into some tall fescue. I chipped out and then stuck it up near the green before going up and down to salvage my bogey with a 12 footer. One of the things you’ll notice when playing the Fazio Course vs the Nicklaus Course at Pronghorn is the generous landing areas in the fairway and especially near the greens. This was particularly evident on #3. While a long course, you have much more room for error than on it’s sister course. After a solid drive, I sliced my hybrid over some trees that barely missed the completely open, 40 yard wide area to the right of the green. While I missed it bad enough to land in the fescue, this is a hole where you shouldn’t be afraid to let it rip. If you miss right, the course conditions are so well maintained that an up and down is totally possible, as I demonstrated on 2. The par 3 4th hole is one of the best examples on the course of Fazio making it feel as though a course just appeared on top of the land it sits on. Between tee to green there’s a very large bunker that while mostly out of play, is absolutely beautiful. You see this time and time again on this course. And it truly adds to the experience. It’s amazing that during all 18 holes I didn’t hit it in the sand once. The 6th on the Fazio Course had a few pretty unique features and is one of the best risk/reward holes on the course. You can bomb it over the trap and water on the left and get it right up close to the green, or you can knock it out into the fairway (as I did) and have a relatively easy approach in. A natural creek runs down the entire left hand side of the hole and around the front of the green making for a beautiful oasis-like feeling in the middle of the desert. As you drive the cart around to the green, the creek runs through the cart path, literally, which is kind of a cool feature. Do you tempt fate and go left? Or layup right? Man, the 7th hole was a beast. Measuring 438 from our tees this was a monster par 4. Luckily for me it was around this time I was starting to find my groove. I had a good drive and a decent 190 approach shot that left me just to the right of the green. I chipped up and was able to save bogey, which on this bad boy, I was totally happy with. Another good example of Fazio giving you good bailout spots around the green. The 8th hole on Pronghorn is one of the most unique golf holes in the world – and it’s the one I’ve been dreaming of playing for years. While they were blasting rock to create this hole, one round of dynamite didn’t blast out like it was supposed to. Instead it caused the whole area to cave in, which is when they discovered an ancient lava tube that stretches 100s of yards under the course. Fazio completely redesigned the hole in order to incorporate the tube. Not only does it have a good story, but it’s especially exciting to play it. I took my time and landed it pin high before having it roll to the back of the green. I putted in for par, in what began the best 5 hole stretch I’ve ever had. In the cave itself, it’s about 20 degrees cooler, and they are known to host cocktail parties and other events inside. Talk about my kind of cocktail party. The 9th is a long par 5 dogleg right and the #1 handicap hole on the course. Simply due to the length it reminded me of the 12th at Crosswater which measured the same distance. My 3 wood tends to be totally hot or totally not, and with the good round I was having I shouldn’t have done anything to jeopardize it. Yet here I was club in hand. I held my breath and cranked one out there, and wasn’t entirely sure where it landed. As I got up there I realized I was only about 20 yards off the green. I chipped to within 5 feet and then made the birdie putt to finish the front with what I deemed an excellent 41. Now I’ve had good stretches of holes, and even good 9 hole rounds before. But usually after that, things start going sideways. I get in my head or start over thinking things – but this day, I decided not to do that. I was having an incredible time on the course, was playing well, and I told myself I wasn’t even going to look at my score. So if I was going to keep my good round going I was going to have to start out well on another long par 4 the 404 yard, uphill, 10th hole. I had a great drive that left me behind a big mound of desert, and I pulled out my hybrid to drop it on the edge of the green. Two putts later, I had another par. The first par 3 on the back brought us back to the top of the creek that ran through the entire 6th hole. It starts out in a pond off the 11th green and then floats down the right hand side, before crossing the cart path and continuing on through #6. Here it penalizes you for missing right and there was sand sporadically placed around the green to force a quality shot. I pulled out a 7 iron and landed it about 20 feet away before rolling a birdie putt – my second in 3 holes. This was starting to feel good. The 12th is a short par 5 that is easily the best birdie opportunity on the course. It’s slightly reminiscent of the 15th hole on the Nicklaus course with sand outcroppings eager to swallow up any missed tee shot. That said, as long as you stay left you have plenty of room to land safely. I played this one smart and got it on in 3 before two putting for par – ending the best 5 hole streak of my life at 2 under. This course is giving me a lesson in big boy golf, and I’m not even playing difficult tees. I’m used to 350-375 yard par 4s that leave me with an approach wedge in. All day I’ve been hitting 6s and lower and the 13th was no different. Got a 6 iron close, but missed my par putt by inches, ending my hot streak. Despite the fact it was one of my worst holes of the round, I really liked the 14th. It was very reminiscent of my favorite hole on Nicklaus, the short #12. I landed a 4 iron in the middle of the fairway and then just made a few mental errors and flubbed it before hitting it off the back of the green. My two putt had me card my first double of the round. I was just hoping this wasn’t going to be a trend during the finishing holes. On the 15th you have plenty of room to miss right, which is a good thing for me. I launched my drive out there with a high fade, that had me pretty worried until it came down safely on the right hand side of the fairway – a few more yards and I might have found myself in trouble. I barely missed the green and then chipped up for 2 putt bogey. At this point, I’ve gotten over how amazing the conditions are, and am simply enjoying a beautiful stretch of holes that keep getting better and better. This is where it usually all falls apart – the last three holes. The 16th is a relatively straight forward par 3, with a few bunkers, but overall a good sized landing area. I waffled between a 6 and a 7 and ended up landing a 6 iron about 20 feet from the pin, resulting in an easy par. The dogleg left 17th has one of the more interesting features on the course with it’s dual split greens. The right green is heavily bunkered and slightly shorter, whereas the left green has a small landing area with trees and vegetation abound. Our pin was on the left green and after a drive to the ride hand side of the fairway I landed my approach about 5 feet from the pin. I narrowly missed my birdie putt by an inch for an easy tap in par. It was then that I made my biggest mistake of the round. I’d done a great job of not adding up my score and just enjoying the day. But after looking at my phone where I was recording the round I noticed I was 8 over. A par would be an 80, something I’ve never even been close to shooting. I turned to Collin and said “I just made a huge mistake, I looked at my score.” He just shook his head. The split greens from the 17th fairway. The 18th is one of the best finishing holes I’ve ever come across. A long dogleg left with heavy bunkering and water on the left side, you’re forced to make solid shots if you want to score well – but the green is reachable in two if you hit a solid drive. After the round I realized that up to this point I’d hit every single fairway of the day. 18th tee? I hooked it so hard into the trees it’s not even funny. We searched valiantly for the ball, but to no avail. My second tee shot was much better, landing about 250 out in the middle of the fairway. My second shot got lucky in that it bounced off some rocks and vegetation and came back to rest in the rough – leaving me 100 yards and a blind shot to the green, with the pin directly behind a bunker. No guts no glory, right? I lofted up an approach wedge and stuck the green about 15 feet from the pin, and two putted from thre. Downside? I was forced to take a 7 due to my choke off the tee. In the end? I shot an 82. 10 days before this round, my previous best was an 87 (I shot my first ever 85 last weekend at Trysting Tree in Corvallis). To have a career day on one of the best courses in the State was easily the highlight of my golfing career, and one that I’ll remember for a long time to come. Par 3: Hands down the 8th hole. 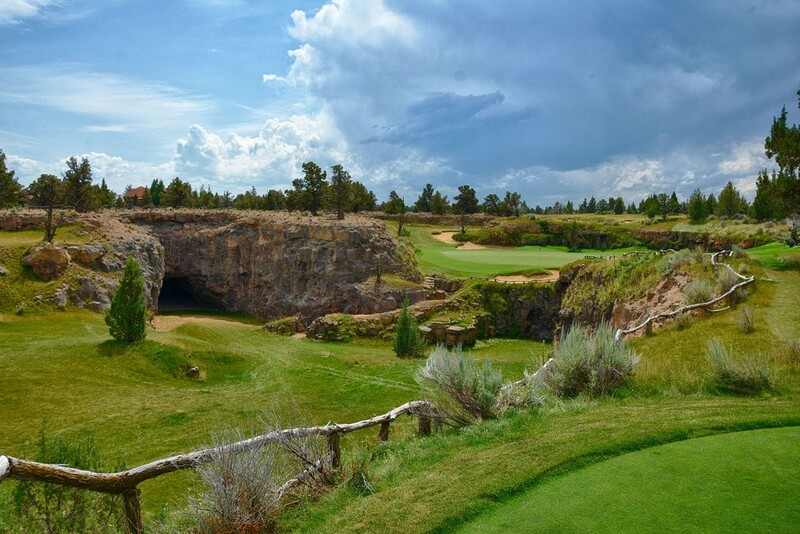 It’s one of the most unique holes in the world, and even more fun to play than you’d expect. Par 4: This is a tossup for me between the opening hole and the 14th. The opening hole is great in that it sets the scene for what’s to come and isn’t overly difficult. But I love the risk/reward of the 14th and would probably give the edge to that. Par 5: The 18th is a hell of a golf hole, and probably aside from the 15th on the Nicklaus, is my favorite par 5 on the whole property. Funny considering all of those holes resulted in my worst scores of the round. Get to Pronghorn. It doesn’t matter which course you play, both are memorable, in impeccable shape, and will have you coming back for more. Special thanks to Joey Pickavance, Ed Jackman and Collin Fowler for making my time at Pronghorn so enjoyable and memorable. I have no doubt that I’ll be back soon.